Claudio Monteverdi’s L’Orfeo first premiered in the Italian city of Mantua on the 24th of February in 1607. L’Orfeo is an allegorical opera in five parts and the plot is centered around the young demigod Orpheus, who defies even the laws of the underworld to bring back his beloved Eurydice. The opera was written in the borderland between the Renaissance and the Baroque eras. The music, as well as the allegorical theme of gods and heroes, echoes of the high Renaissance. Below is a clip of the complete L’orfeo conducted by Jordi Savall. further below is the synopsis of the five acts of the play. 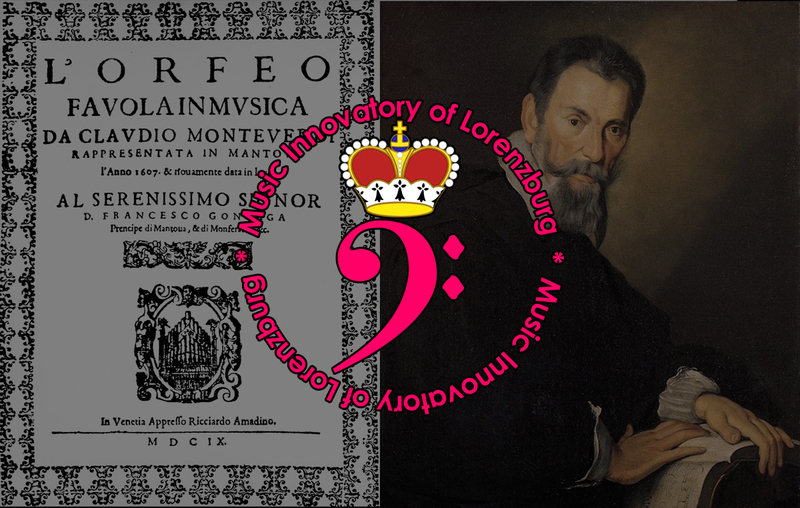 The Music Innovatory of Lorenzburg invites you to join in the celebration of this lively 412-year-old. Enjoy! After La musica’s request for silence, the curtain rises on act 1 to reveal a pastoral scene. Orfeo and Euridice enter together with a chorus of nymphs and shepherds, who act in the manner of a Greek chorus, commenting on the action both as a group and as individuals. A shepherd announces that this is the couple’s wedding day; the chorus responds, first in a stately invocation (“Come, Hymen, O come”) and then in a joyful dance (“Leave the mountains, leave the fountains”). Orfeo and Euridice sing of their love for each other before leaving with most of the group for the wedding ceremony in the temple. Those left on stage sing a brief chorus, commenting on how Orfeo used to be one “for whom sighs were food and weeping was drink” before love brought him to a state of sublime happiness. Orfeo returns with the main chorus, and sings with them of the beauties of nature. Orfeo then muses on his former unhappiness, but proclaims: “After grief one is more content, after pain one is happier”. The mood of contentment is abruptly ended when La messaggera enters, bringing the news that, while gathering flowers, Euridice has received a fatal snakebite. The chorus expresses its anguish: “Ah, bitter happening, ah, impious and cruel fate!”, while the Messaggera castigates herself as the bearing of bad tidings (“For ever I will flee, and in a lonely cavern lead a life in keeping with my sorrow”). Orfeo, after venting his grief and incredulity (“Thou art dead, my life, and I am breathing?”), declares his intention to descend into the Underworld and persuade its ruler to allow Euridice to return to life. Otherwise, he says, “I shall remain with thee in the company of death”. He departs, and the chorus resumes its lament. In the Underworld, Proserpina, Queen of Hades, who has been deeply affected by Orfeo’s singing, petitions King Plutone, her husband, for Euridice’s release. Moved by her pleas, Plutone agrees on the condition that, as he leads Euridice towards the world, Orfeo must not look back. If he does, “a single glance will condemn him to eternal loss”. Orfeo enters, leading Euridice and singing confidently that on that day he will rest on his wife’s white bosom. But as he sings a note of doubt creeps in: “Who will assure me that she is following?”. Perhaps, he thinks, Plutone, driven by envy, has imposed the condition through spite? Suddenly distracted by an off-stage commotion, Orfeo looks round; immediately, the image of Euridice begins to fade. She sings, despairingly: “Losest thou me through too much love?” and disappears. Orfeo attempts to follow her but is drawn away by an unseen force. The chorus of spirits sings that Orfeo, having overcome Hades, was in turn overcome by his passions. Back in the fields of Thrace, Orfeo has a long soliloquy in which he laments his loss, praises Euridice’s beauty and resolves that his heart will never again be pierced by Cupid’s arrow. An off-stage echo repeats his final phrases. Suddenly, in a cloud, Apollo descends from the heavens and chastises him: “Why dost thou give thyself up as prey to rage and grief?” He invites Orfeo to leave the world and join him in the heavens, where he will recognise Euridice’s likeness in the stars. Orfeo replies that it would be unworthy not to follow the counsel of such a wise father, and together they ascend. A shepherds’ chorus concludes that “he who sows in suffering shall reap the fruit of every grace”, before the opera ends with a vigorous moresca. Previous Previous post: Happy Christmas from Lorenzburg!